Note: Sheikh Humaid bin Rashid Al Nuaimi of Ajman, Saud bin Rashid Al Mu'alla of Umm al-Quwain, Saud bin Saqr Al-Qasimi of Ras al-Khaimah, and Hamad bin Mohammed Al Sharqi of Fujairah are not pictured. The monarchy of Negeri Sembilan is itself elective. The British ruled Indian Empire became independent from British rule in 1947 and became the Dominion of India and the Dominion of Pakistan and in 1950 India became the Republic of India, in 1956 Pakistan became the Islamic Republic of Pakistan, and in 1971 the province of East Pakistan separated from Pakistan to became Bangladesh. Princely states were only in the present-day countries of India and Pakistan, and not Bangladesh. The princely states who were vassal states of the British, had a certain degree of power and autonomy during the British Raj. The princely states had integrated into the newly independent India and Pakistan between 1947-1975 (the majority of states ascended into India or Pakistan in 1948) and the former monarchs of the princely states who joined before 1971 in India and before 1972 in Pakistan became titular rulers that received a privy purse and initially retained their statuses, privileges, and autonomy. During this time, the former princely states in India were merged into unions, each of which was headed by a former ruling prince with the title of Rajpramukh (ruling chief), equivalent to a state governor. In 1956, the position of Rajpramukh was abolished and the federations dissolved, the former principalities becoming part of Indian states. The states which acceded to Pakistan retained their status until the promulgation of a new constitution in 1956, when most became part of the province of West Pakistan; a few of the former states retained their autonomy until 1969 when they were fully integrated into Pakistan. The Indian Government formally derecognised the princely families in 1971, followed by the Pakistani Government in 1972, in which there titles, autonomy, and privy purses were take away. Presently the rulers of the former princely states are prentenders who carry out ceremonial roles. Indonesia is a republic, however several provinces or regencies preserves their own monarchy, although only Special Region of Yogyakarta that retain actual administrative authority, the rest only holds cultural significance. Politics of the United Arab Emirates takes place in a framework of a federal, presidential, and a constitutional monarchy. 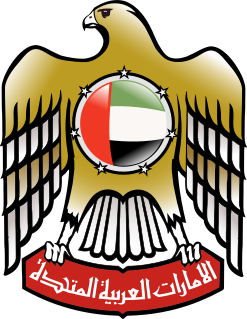 The United Arab Emirates (UAE) is a federation of seven constituent monarchies: the Emirates of Abu Dhabi, Ajman, Dubai, Fujairah, Ras al-Khaimah, Sharjah, and Umm al-Quwain. According to convention, the ruler of Abu Dhabi is the President of the United Arab Emirates and the head of state, and the ruler of Dubai is the Prime Minister of the United Arab Emirates, the head of the government. Umm Al Quwain is the least populous of the seven constituent emirates in the United Arab Emirates, located in the north of the country. The emirate is ruled by Saud bin Rashid Al Mualla. It had 72,000 inhabitants in 2007 and has an area of 770 km2 (300 sq mi). Sheikh Zayed bin Khalifa Al Nahyan, known as 'Zayed the Great' was the grandfather and namesake of Sheikh Zayed bin Sultan, founder of the United Arab Emirates. This is a list of Rulers of Arab states of the Persian Gulf. Kraton or Keraton is the Javanese word for a royal palace. Its name is derived from ka-ratu-an which means the residence of ratu. Ratu is the traditional honorific title to refer the "ruler". 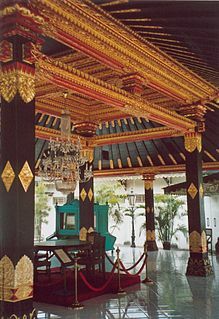 In Java, the palace of a prince is called puro or dalem. The general word to designate a palace is istana, as in Indonesian and Malay. Yogyakarta Sultanate is a Javanese monarchy in Yogyakarta Special Region, Indonesia. The current head of the Sultanate is Hamengkubuwono X. The Vorstenlanden were four native states on the island of Java in the Netherlands Indies that were nominally self-governing under suzerainty of the Kingdom of the Netherlands. Their political autonomy was however severely constrained by treaties and settlements. Duchy of Pakualaman or simply Pakualaman is a minor Javanese princely state within the Sultanate of Yogyakarta. It was created in 1812 when Natakusuma was rewarded for helping the British quell the conflict in Yogyakarta in June 1812. It became the mirror-image of the Mangkunegaran principality in the territory of the Susuhunanate of Surakarta. The Sultanate of Cirebon was an Islamic sultanate in West Java founded in the 15th century. It is said to have been founded by Sunan Gunungjati, marked by his letter proclaiming Cirebon's independence from Pajajaran in 1482, although the settlement and the polity had been established earlier in 1445. 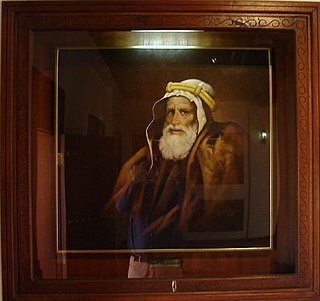 Sunan Gunungjati also established the Sultanate of Banten. It was one of the earliest Islamic states established in Java, along with the Sultanate of Demak. The Trucial Coast were a group of tribal confederations in the south-eastern Persian Gulf, previously known to the British as the "Pirate Coast", which were signatories to treaties with the British Government. These treaties established an informal protectorate by the United Kingdom, and the sheikhdoms, or emirates, were a British protectorate from 1820 until 1 December 1971, when the seven principal trucial sheikhdoms became independent. Six were to form the United Arab Emirates the next day; the seventh – Ras Al Khaimah – joined the Federation on 10 February 1972. Surakarta Sunanate is a Javanese monarchy centred in the city of Surakarta, in the province of Central Java, Indonesia. Al Falayah fort is an 18th-century fort in Ras Al Khaimah, United Arab Emirates (UAE). Traditionally the summer residence of the ruling Al Qasimi family, the fort was used as a rest house.